CARL MANUFACTURING-Professional Quality Rotary Trimmer. 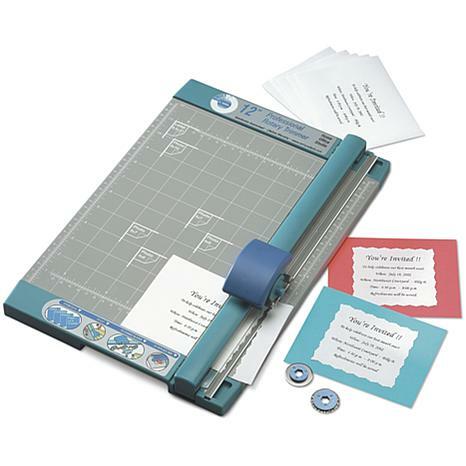 This heavy duty table top rotary trimmer can handle just about anything you desire to cut: Photos, cardstock, chipboard, paper, foam, acetate and much more! Cuts up to ten 20 lb. 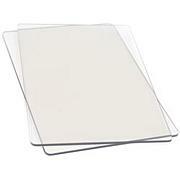 sheets of paper at one time! 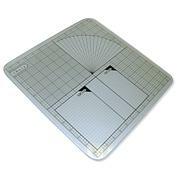 The 12x9inch mat with detailed ruler markings for inch, centimeter, and millimeter, is replaceable so you don't have to get a whole new trimmer when it wears out, an assortment of blades are available in a variety of styles that are quick and easy to change (trimmer comes with one straight blade only), sturdy metal base is calibrated with preset measurements for A4, Letter,10x8in photo, 7x5in photo, 6x4in photo and many more popular sizes of papers. 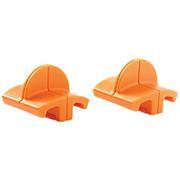 Trimmer measures: 15x10-3/4x2-3/4in. Colors: gray, blue. Imported. This is probably one of the best made trimmer's I have found. I searched all the local craft stores and office supply stores. This was by far the best price and best quality made. So glad I purchase this one. I got my paper trimmer & it is great. Really well made. I know I'll use it for many years. When are you going to have the extra blades to go along with it? 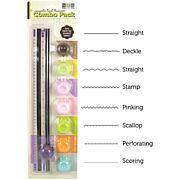 This is a great trimmer for your craft space. However, I will use my lighter weight trimmer for crop nights.